Internet marketing for Law firms help them reach new potential clients. Reach all of those clients you cannot reach by word of mouth in record time. Traditionally, new clients for law firms come from referrals and word of mouth; however, increasing competition and specialization has forced lawyers to diversify in order to reach new potential clients. With Internet marketing, law firms can reach new potential clients in record time by using a combination of online marketing strategies. With Internet marketing, your firm can be listed in relevant positions when a client is looking for legal aid. We can make that happen, contact Prospect Factory Online today. Be that “Act of God” for your client. There are thousands of clients searching for legal representation every day, and most of them turn to the Internet and search engines to find suitable services. With so many potential leads you cannot afford to be missed. With SEO for law firms and Pay per click for law firms, your potential clients will find you and land on your web site. Three days is how long it will take for you to witness the beginning of successful lead generation for your business. In such short period of time, we will design and launch your custom online campaign, and then operate, manage and make improvements to provide pre-approved incoming traffic to your website. Your new client will have perfect landing and your firm will be able to quickly take specific conversion actions to successful sales closure. Internet Marketing for Law Firms Provides Great ROI – Zero risk investment, high yields… a great deal. Positive results. – Internet marketing for law firms provides a ROI of twice your investment, at least. For every dollar invested in online advertising we will assure return of at least two. Some clients can even give you up to ten times return on investment. Are you curious why most of our clients’ campaigns have ran continuously for three years with positive results? Come and find out. No compromised warranties. Pay per results… it is that simple. If we do not yield results based on agreed objectives, you will stop paying. Exposure and positioning. – High traffic search engines provide exposure to tens of thousands of potential clients and contribute to the generation of fine tuned leads for landing. Moreover, they position your brand ahead of the rest. Measurement. – We set metrics and provide reports that allow you to track your advertising efficiency. Every successful recipe has its own secret component. One thing that distinguishes our Internet marketing service for law firms from that of competitors is our ability to help you track your business’ initial response to qualified leads through our Secret Shopper, of which results are reported back to you so that you are able to improve offline initial contact and sale closing. Assure the sale and get revenue out of every lead. Internet Marketing fro Law Firms – from start to leads in five simple steps. Your lead generation campaign is a five step process – place, engage, convert, initiate, and measure – which we implement for you at our Prospect Factory. 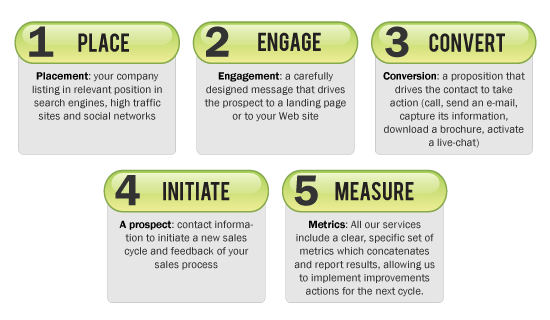 Our methodology assures consistent implementation, objective measurement, and improvement of your campaign within days. All our Internet marketing campaigns for law firms include a clear, specific set of metrics which links and reports results, and allows us to take improvement actions for the next cycle. Powerful search engine marketing toolbox at your fingertips. Competitive fees and great results. Your website can be listed on the major search engines with great rankings thanks to our combined experience on search engine marketing and web design. We can either work hand in hand with designers or hosting companies you choose or take care of your new website and manage all aspects of your online strategy. Internet Marketing for Law Firms can Inclue a Complete Portfolio of Services. Whenever your firm ad is found on relevant positions of sponsored links section of search engines you obtain perfect segmentation, perfect landing and a high conversion rate. We can put you on top positions of sponsored listings for Google and similar engines and make optimal use of your budget. Have potential clients contact you when they see your ad. A strategy that helps your site reach top positions on searchengine listings and avoid the need to pay for clicks. Your site will reach top positions in the organic or natural listing space and capture leads for your firm. We apply specialized techniques and algorithms as rankings of search engines are constantly shifting and prevent you for paying for clicks. Reach your contacts and current clients with an e-mail newsletter, a promotion, an invitation or an online survey, and reach your contacts with carefully designed e-mail communication that can be meticulously measured. Permission e-mail campaigns complement other search engine marketing strategies and improve results. We fully comply with permission marketing best practices (no spam). Segmentation. Get prospects from search engines from within social media where you can quickly get high quality leads based on common interests, groups and applications using a well thought set of ads and tools to select potential clients. Press Releases – Get your story out there. Increase your traffic, generate interest and reach out to prospects. We optimize and distribute your press releases along with the implementation of a result tracking model, thus constantly improving your public relations strategy. SEO friendly Website design and development for Law Firms. We resort to advanced technologies for website design and development key to an Internet strategy. Our websites are search engine friendly and feature full admin interface that allows you to update contents yourself and enable us to implement onsite SEO techniques for better search engine marketing techniques. Blog development and management for Law Firms. We develop your blog and help you manage it. A company blog with valuable information is one of the best strategies to position your brand in the digital world. Benefits of Internet Marketing for Law Firms. First things first: We have Law Firms covered. We will make a proposal that matches your budget and meets your needs.